Your kitchen sink and faucet is truly mission control for your kitchen and for your home. You use it every day for almost every task in the kitchen whether preparing meals, making coffee, scrubbing vegetables or cleaning up after meals. So in choosing what is appropriate for your kitchen you need to consider those kitchen sinks which enhance your kitchen design, are functional and will still look good and work well after years of heavy use. Undermount kitchen sinks have a flat lip at their upper rim and are installed under the finished countertop surface which is often granite or manufactured stone. They have a clean look and are easy to clean as food particles on your countertop can be easily wiped into them without a barrier. Drop in kitchen sinks have an elevated rim and are dropped into a created countertop cavity. This elevated rim makes it more difficult to clean as it acts as a barrier when you wish to wipe countertop puddles of water into them. Farmhouse kitchen sinks extend out to the front vertical face of the cabinet and are chosen to accentuate a traditional design, but they are usually large and very functional also. To look good exact installation of these sinks is a must. Integral kitchen sinks are made of the same material as the abutting countertop. They provide a seamless look but if there is any problem with the countertop the problem will extend to the sink as it and the countertop cannot be replaced separately. Because of its many benefits stainless steel sinks have long been the most popular of all sinks in the cooking area. Stainless steel sinks are available in finishes from brushed metal to highly polished finishes. They come in different thicknesses: 18 gauge is good; 16 gauge is thicker and better. Stainless steel sinks are very hygienic and easy to clean and those with thicker metal are quieter. Stainless steel sinks are very durable and longlasting. Stainless steel sinks which have highly polished finishes may show scratches over time. Although the use of fireclay ceramics has been tested over a long period of time it has only recently been used in kitchen sinks. These fireclay kitchen sinks have quickly overtaken porcelain enamel in popularity. Fireclay ceramic sinks are available in a wide variety of colors plus these sinks can be painted or designed with decorative mouldings. These kitchen sinks can offer a period look. Porcelain enamel kitchen sinks essentially are made of white or colored glass that has been bonded to a molded metal shell at extreme temperatures. The process has been used over a long period of time. Porcelain enamel sinks are available in a range of colors. 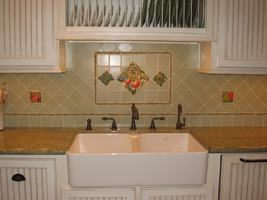 Each kitchen sink conveys a traditional look. Porcelain enamel sinks have a slight risk of scratching and chipping. Are primarily installed for architectural effect. o Copper kitchen sinks convey a showy metal reflective appearance. o Copper kitchen sinks have a high risk of scratching and denting and can tarnish and show water stains. Kitchen faucets include a spout which either includes a handheld sprayer or not. Handheld sprayers let you move the water to where you need it. Kitchen faucets include a spout which comes in different heights and with a different reach. A high-arch kitchen faucet spout provides plenty of room between the bottom of the sink and the spout for washing large pots or oversized dishes. High-arch faucet spouts generally range from 6 inches to the more common 8 to 10 inches high whereas a standard faucet spout is generally from 3 to 5 inches high. The size you choose should always complement the size of your kitchen sink. Kitchen faucets should direct water to the center of your sink. If you have a double sink you must choose a faucet that can reach both basins. Kitchen faucets come with one handle or two. Two handles are generally chosen for architectural effect as it is much more bothersome to regulate the correct temperature of water with two handles then with one. Please call us to discuss choosing a sink and faucet for your kitchen! Westheimer Plumbing & Hardware, Inc.